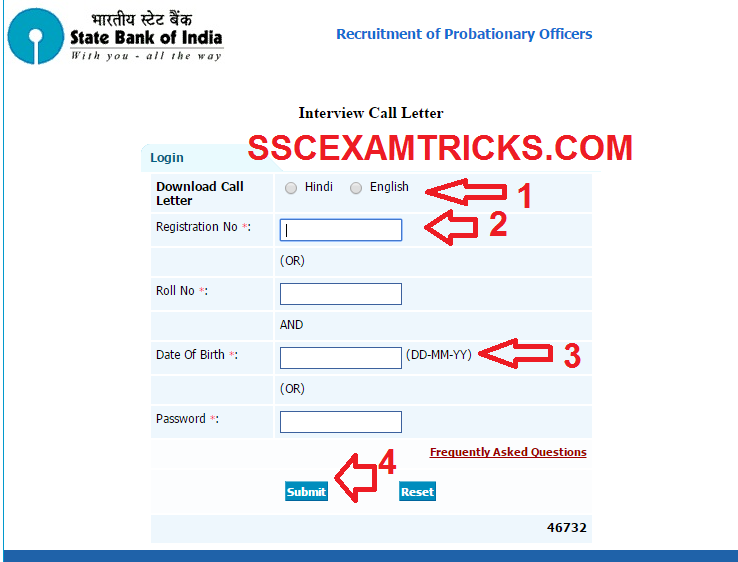 State Bank of India (SBI) has released interview call letters to the short listed candidates of online written exam conducted on 9th, 15th, 23rd and 29th November 2014 for 2986 posts of Probationary Officers. Group Discussion & interview Date has been announced and going to start on 16th February 2015. Provisionally selected candidates for the posts of Probationary Officers (PO) can download their Interview Call letters from the link available in the end of the posts. Candidates are required to select their language of Interview call letter. They need to enter registration no. and dates of birth then press submit button in the end to download Interview call letter in PDF format. Take a print of Interview call letter and note down the venue and timing of group discussion and interview. Candidates are advised to prepare their original document along with a photocopy of documents duly self-attested required to submit at the time of interview. These qualified candidates are called for 2nd stage which is group discussion and interview stage. Three times more than required candidates will be called for interview. Reach the venue of Interview 30 minutes before the time mentioned. Bring computer generated online application, result print, original documents original along with one set of self-attested of all the documents to the venue of interview. Address proof i.e. PAN Card, Ration Card, Aadhar Card, Voter card or Driving License. Bring two extra colored recent passport size photograph (same as pasted on computer generated application form). Bring Caste/PWD/EXS certificate to claim for seat available for reserve category. NOC (No Objection Certificate) in case of working somewhere. In group discussion, a group of 3-7 candidates will be called to discuss any current issue. The time for group discussion is expected at least 10-15 minutes. A current topic will be asked to make discussion about pros and cons of the topic. The group discussion must be attended in English to English. All Candidates will have to maintain focus and discipline during the group discussion. The key to qualify group discussion will be patience, depth knowledge of topic, fluency in English and brief discussion with strong example as evidence/fact/figures. Some expected topics may be asked for discussion in group discussion. After Group Discussion (20 marks) + Interview (30 Marks) and performance in online written exam (200+50 Marks), a merit list of total 100 marks will be prepared. A list of selected candidates will be released on the official website of SBI. Click here to download the detailed selection process for SBI PO 2014-15.